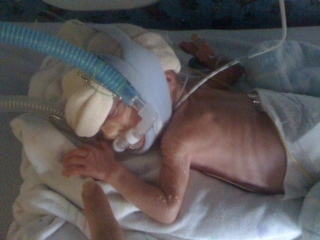 In our September edition of our Preemie Family newsletter we learned about the incredible Shaw Richter, a preemie born at 27 weeks, who was 2 lbs. 7 oz. at birth and spent 122 days in the NICU. Read more in an update by his mother, Candace. I returned last night to the NICU to speak to current NICU families. Almost three years later and so many emotions come flooding back. One look at these families and I see myself – tired, unshowered, lost, consumed with worry. It is amazing how resilient we are. The color is back in my cheeks, my son is laughing, racing, chatting up anyone that will listen. 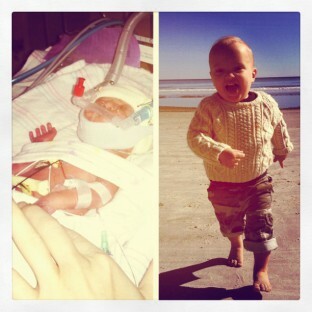 We spent 122 days in the NICU. Our son endured 22 spinal taps, 2 brain surgeries, 2 airway surgeries, endless blood transfusions, meningitis, MRSA and so so much more. We were told he may not walk or talk after his IVH and so far he hasn’t missed a beat. Our son, Shaw, he is my hero. I hope one day to have half the strength and tenacity as he had when he entered this world!! What a miracle to witness. Shaw inspired the Richters to start a foundation called Bee Mighty. Bee Mighty funds therapy and medical equipment for Neonatal Intensive Care Unit graduates. This November 16th, Bee Mighty is holding it’s first annual fundraiser, Bee Something for Bee Mighty in Charlotte, North Carolina. All funds donated will go towards the development of a child. For event details: www.beemighty.org PLEASE PASS IT ON!